Learn valuable Flexibility, Shaping and Conditioning using Sliders. 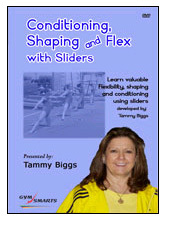 Tammy Biggs DVD, Conditioning, Shaping and Flex with Sliders, give you several new drills and exercises to improve in these three important areas. Tammy uses the sliders with lunges and mountain climbers, several core strengthening exercises, with tumbling drills from needle kicks to aerials, and increasing flexibility. 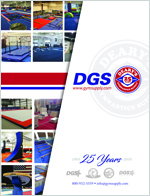 Tammy thoroughly explains all the drills and exercises and has outstanding demonstrations from the best athletes from Cincinnati Gymnastic Academy.